Nettle Meadow's Kunik for sale. Buy online at Zingerman's Mail Order. Gourmet Gifts. Food Gifts. Triple crème: the math-iest cheese in the world. It's a normal day and you're strolling through your local cheese shop when you see a sign on small, but substantial round of cheese that says triple crème. In not-so-layman's terms it means that its butterfat content is at least 75%. It doesn't mean 75% of this cheese is butterfat. Roughly half of this cheese is moisture, so it's more like 75% of 50% of the cheese is butterfat. We're getting into some heavy math right now so I'll give you one last point of reference. Butter is between 80-85% total fat, which is way more than any cheese has, so eating this cheese is not like eating a stick of butter. What does it all mean to your mouth? Well, there's no quardruple crème cheese that I'm aware of so triple is as rich as it gets. Always creamy, it fills your mouth with flavor. 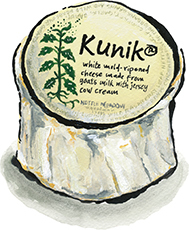 Made by Nettle Meadow in upstate New York, Kunik is a triple crème made from pasteurized goat's milk (75%) and pasteurized Jersey cow cream (25%). The Jersey cream is added right before the curd is formed and balances the bright, citrus notes of the goat's milk with rich buttery flavors from the cow's milk. Together, they make an incredibly flavorful cheese no matter what the percentages, one that'll have people gushing when you serve it to them.